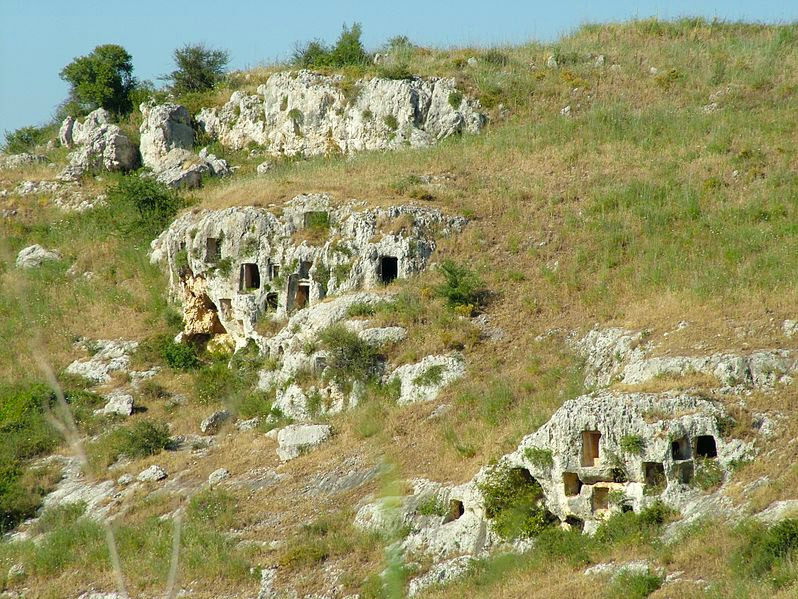 Pantalica, Syracuse, Sicily, is located on a limestone promontory and is best known for its rock-cut tombs (13th to 7th centuries BC.). 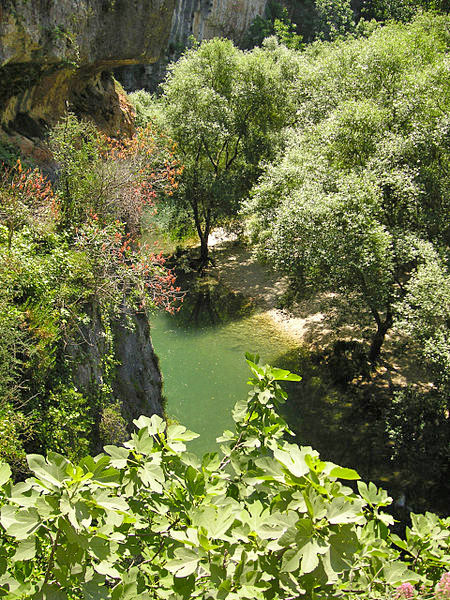 Surrounded by a deep gorge formed by Calcinara and Anapo rivers, is also an important nature reserve (Riserva Naturale Orientata Pantalica): bat caves, flora and fauna. The Sicels gave Sicily the name it has held since antiquity, but they rapidly fused into the culture of Magna Graecia. New large sites, like Pantalica, appeared in the hilly coastal hinterlands, probably chosen for defensive reasons. The remains visible today consist mainly of numerous prehistoric burial chambers cut into the limestone rock, sometimes provided with a porch or short entrance corridor in front of the burial chamber, originally sealed with stones or a slab. There are also some larger rock-cut houses of uncertain date (often said to be Byzantine, but possibly of earlier origin). The so-called anaktoron, or princely palace, located near the top of the hill, is also controversial. Thought by some archaeologists originally to have been a Late Bronze Age building, inspired by palatial buildings of the Greek (Mycenaean) Bronze Age, it was more certainly occupied in the Byzantine period. 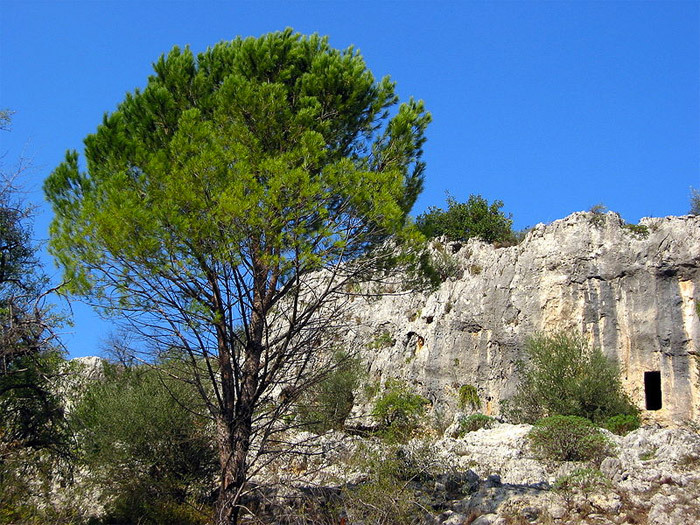 The remains of a large defensive ditch, cut into the limestone, are clearly visible at Filiporto (on the western side of the promontory, nearest to Ferla). This probably dates to the 4th century BC and represents a defensive work of Greek military design, possibly in line with a policy of Dionysius of Syracuse, designed to secure allied sites in the hinterland. There are also three small Medieval rock-cut chapels popularly called the Grotta del Crocifisso (near the North cemetery), Grotta di San Nicolicchio (on the southern side) and Grotta di San Micidario (at Filiporto), which preserve very faint traces of frescoes and attest the presence of small monastic communities.